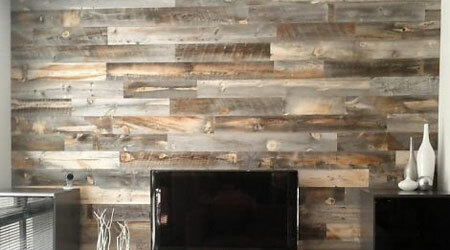 DIY plank walls are an increasingly popular trend – whether you just want to add some texture to your walls or want to follow the reclaimed wood trend, adding a plank wall to your home is an easy project that’ll really transform the entire room. If you just want the boards rather than the full wood texture, MDF is a cheap material that will achieve the effect you want. Before you even buy your materials, measure your wall and decide how thick you’d like all of the boards to be. That way, you can get your MDF cut to size in-store to reduce the amount of work you need to do. Remember that your ceiling line may not be perfectly level, so check your angles with a spirit level before you add the first plank to your wall. Once you have that perfectly level, you can use pennies as spacers and just follow the first plank so the rest should be a lot faster to put up. Once you’ve nailed all of your planks down, don’t forget to use some filler over the nails. 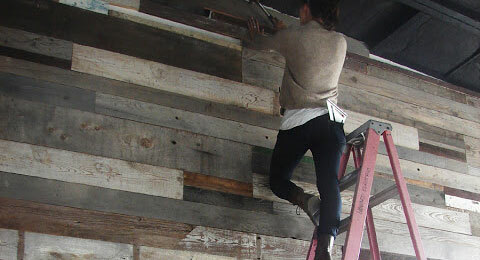 Sand it all down before painting so you have a perfectly even finish to your plank wall. You may want to use adhesive instead of nails, but this won’t hold warped boards to the wall so you will need to compromise and at least use nails on the boards that won’t sit flush with the wall. Part of the charm of timber walls is the texture of the wood itself. Reclaimed wood is a major trend in 2016, but buying reclaimed boards can be expensive (and difficult if you don’t have an architecture salvage yard nearby). Luckily, you can fake it with stains and brand new timber. You can even use a few different stains to get a variety of colours to use together on your wall. If you would just like a stain, it’s a relatively simply process of painting your stain onto the wood and waiting for it to dry. If you’d also like a distressed texture to the wood, you can achieve that in a variety of ways – hitting it with chains, sanding it, drilling small holes (to create fake termite holes), scratching the wood with a chisel tip, or using steel wool with vinegar to age the wood. Image credits: Thank you to Design-Milk, Brooklyntowest.blogspot.com, and Home DZine for the images.